Gibson Hall, shown here in its original configuration. This outbuilding, which was architecturally similar to Gibson Hall, provided restroom facilities. Today’s Gibson Hall began life in 1936 as a three-sided picnic shelter constructed by the Works Progress Administration. The hall also had its own outbuilding that provided for restrooms and storage. 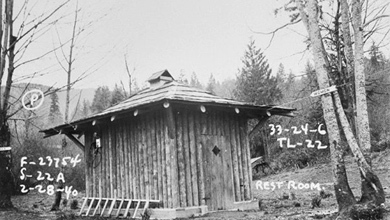 Town Park was also the site of the Issaquah Free Campground and another WPA project, the State Salmon Hatcher. 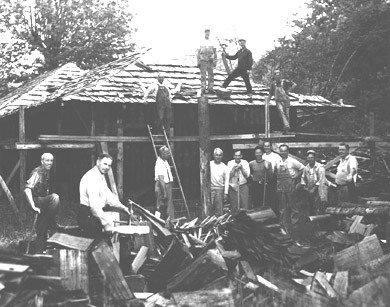 In 1948, community volunteers added windows, doors, walls and a ceiling to create “Town Park Hall”, which opened in early 1949 for use by scouting troops and community groups such as the Kiwanis Club. 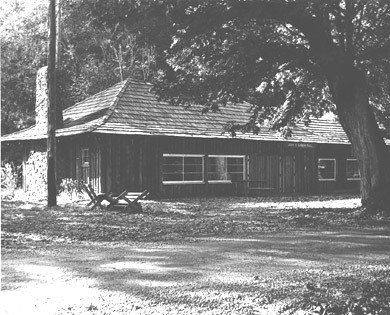 In 1952, the Kiwanis Club leased the building from the Town of Issaquah for $1 per year, and agreed to expand, maintain and manage the building for the benefit of the community. Members of the Kiwanis Club remodeled the building extensively and added the north wing, which includes a kitchen and restrooms. The club renamed the building in memory of John H. Gibson, a club member who had served at different times as Issaquah’s mayor and postmaster. The Kiwanis Club of Issaquah currently meets at Gibson Hall each Wednesday at noon. The club maintains the building, provides free use to many community groups, and manages public rentals. Includes information from King County Historic Resources Inventory, 2003. 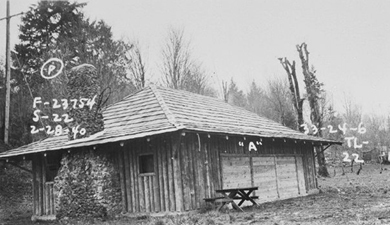 Gibson Hall, located on what was at one time the Town of Issaquah’s Free Camp Ground, was constructed as a Works Projects Administration (W.P.A.) project in 1936. The W.P.A. provided employment to many during the Great Depression. Other historic buildings in Issaquah constructed under the W.P.A. include the Issaquah Sportsman’s Club and State Salmon Hatchery. Gibson Hall is a log building with a rectangular plan and a bell-shaped roof form. The roof has wide eaves supported by brackets. The building has a large rock chimney located on the south elevation. The fenestration originally consisted of small square windows. Three larges openings were located on the east elevation. Two large windows flanked by doors have since replaced the openings. The building is clad in log stockade. Since construction, a north wing has been added which now serves as a kitchen, and a lean-to section has been added to the back (west elevation) of the building to serve as storage.